..."Today our Scriptures show us the love of the Shepherd for all sheep and Jesus’ claims to be the good shepherd,indeed he often spoke of his sheep in the gospels. The reading from Acts shows us as well what can be done in Jesus’ name. But let’s stop a moment and consider what that may mean. In Aramaic “Eshoo” (Yeshua/Joshua in Hebrew, Jesus in Greek) was a popular name of the times. It is surely not magic to pray and utter Eshoo. The power is not in just saying the name but in knowing God as Jesus did, as ourParent, our Abba/Amma Mommy/ Daddy, if we understand Jesus’ words. The power to heal and be a healing force as Jesus was is in our relationship to God. We must fill ourselves with God awareness and God knowledge and knowledge of the whole human family as Jesus did, with the help of Christ’s living spirit within us. How else would we be able to offer our lives for the sheep, to pour ourselves out when we are not even sure at times that there is anything left to pour! The gospel tells us that Jesus, our Shepherd, knows us even as Abba God knows him and he knows Abba God. Through Christ we are to know God that way too and, like Jesus, shepherd one another and sheep not of the fold. Jesus was on familiar terms with his Parent God. In Aramaic “Abba”, “Ab-ba” comes from the root AB meaning all fruit proceeding from the source of Unity. 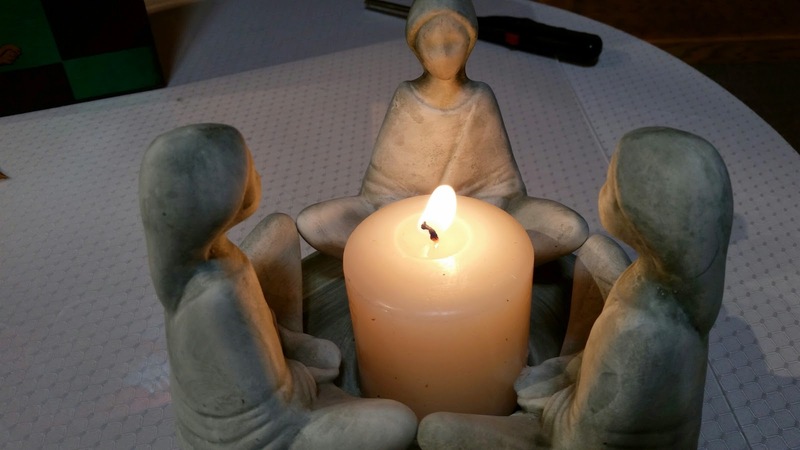 Abwoon, a derivative used in Jesus prayer, has no gender and can be translated Divine Parent and it refers to a cosmic birthing process, giving birth to the universe and beyond. What Jesus is saying in John 10:16 when he speaks of the sheep that are not of this fold is that our loving Parent God has birthed all of the people in the world and all are to be united under our birthing God, Alaha. Abwoon d’bwashmaya ,the first words of Jesus prayer usually translated “Our Father….” is more adequately translated Birther God, Name of Names, Father/Mother of the cosmos and all within it, Source of all good. Jesus came to unite ALL to our Birther God, and to show us how to do just that-by growing in grace to be able to lay down our lives, to pour ourselves out, for the sheep, any of them, all of them." Yet we reflect-how hard it is to give ourselves away as Jesus did. While some lambs are cute and cuddly some are rebellious, old,desperate, stubborn and frightened. How hard it is to literally and otherwise go out on a limb for those who may be hanging off of the cliff and not very appealing. To risk oneself for those who are angry and bitter, hurt and hurting others, and labor intensive. Those whose ways and cultures and languages are different. What do we need to learn to do and to appreciate to embrace sheep not of this fold, our brothers and sisters of difference? How can we turn to the Shepherd to empower us in knowing and loving and and reclaiming for Birther God. For each one of us there is a different answer to how do we draw close to our loving and living God so that we can renew ourselves and shepherd one another. Based on the 23rd Psalm the hymn by Marty Haugen may guide us: “Shepherd me oh God, beyond my wants, beyond my fears, from death into life”. Let us also remember that to the original Christ followers, the first Christians who were Jewish followers of Jesus, we ARE the other sheep. 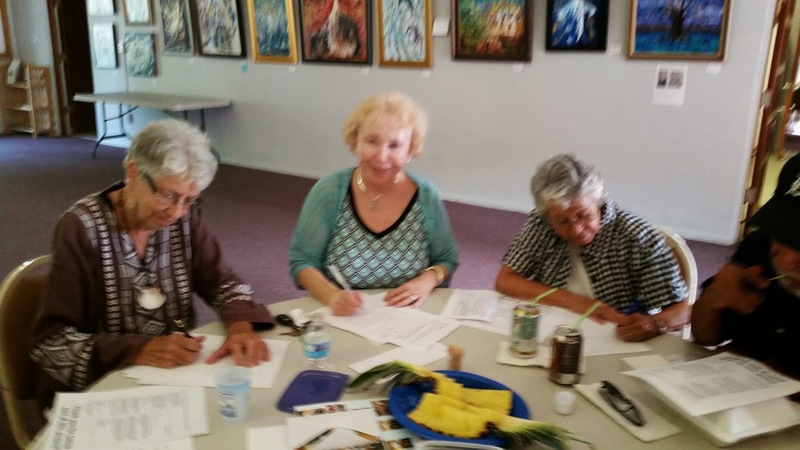 Members of Mary Mother of Jesus Inclusive Catholic Community gathered after liturgy to write letters to Congress to protect and improve access to child nutrition programs. 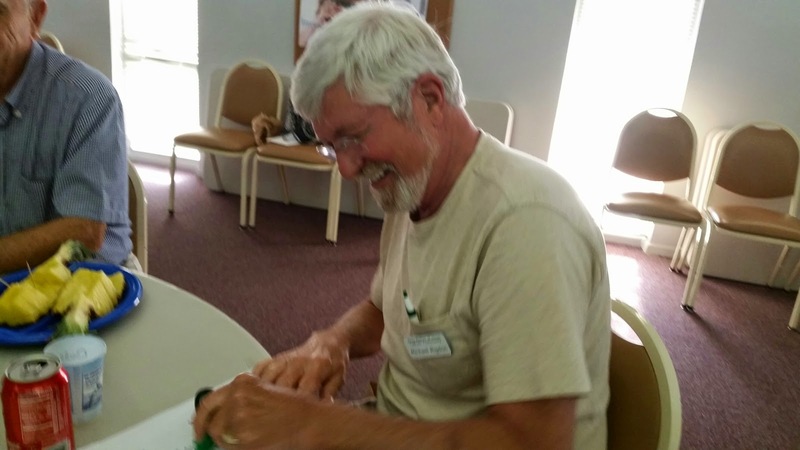 Amid laughter, sandwiches and stories, we wrote letter after letter to end hunger and to remind congress that 80 percent of children who are home during the summer have difficulty getting to sites where food for low-income children is available. We asked for federal safety-net programs for children at rish of hunger. We advocated for healthy nutrition to help kids grow and learn. “Champagne corks did not pop on either side of the Atlantic on April 16, 2015 when the Vatican and the Leadership Conference of Women Religious announced the end of the Doctrinal Assessment of LCWR, but there was certainly shared relief that this sorry chapter in church history is closed. ..." new models of church are not rocket science but the stuff of many people’s contemporary experience, including many people in religious communities. We learned in this instance from women religious that they operate out of egalitarian power models, that they are deeply reliant on prayer and sacraments (some of which they celebrate themselves but let’s not go there), and when left alone by patriarchs, go about their world-changing work of love and justice because of their faith. Here’s hoping that the end of an unwarranted investigation might be the beginning of a new kind of Catholicism. There is no excuse for anything less." One of the “key words” of social doctrine is “solidarity,” which is a word that perhaps some people thought had seen its day, said the pope. “But in reality, it retains today its prophetic force,” he said. Let us express our solidarity with all social justice issues in our times including gender equality in the Roman Catholic Church! Jimmy Carter, "Losing My Religion for Equality"
"This discrimination, unjustifiably attributed to a Higher Authority, has provided a reason or excuse for the deprivation of women's equal rights across the world for centuries. The truth is that male religious leaders have had - and still have - an option to interpret holy teachings either to exalt or subjugate women. They have, for their own selfish ends, overwhelmingly chosen the latter. Their continuing choice provides the foundation or justification for much of the pervasive persecution and abuse of women throughout the world. This is in clear violation not just of the Universal Declaration of Human Rights but also the teachings of Jesus Christ, the Apostle Paul, Moses and the prophets, Muhammad, and founders of other great religions - all of whom have called for proper and equitable treatment of all the children of God. It is time we had the courage to challenge these views. " German Catholics find Vatican family questionnaire 'too fixated on ideal image of the family', I agree, What do you think? Sometimes, I think the Vatican lives on another planet because their disconnect with the real world, where most people live and love, is so great! One fallout is that young adults in Europe and in the U.S. are missing in action when it comes to weekly attendance at Sunday liturgy and active involvement in their parishes. 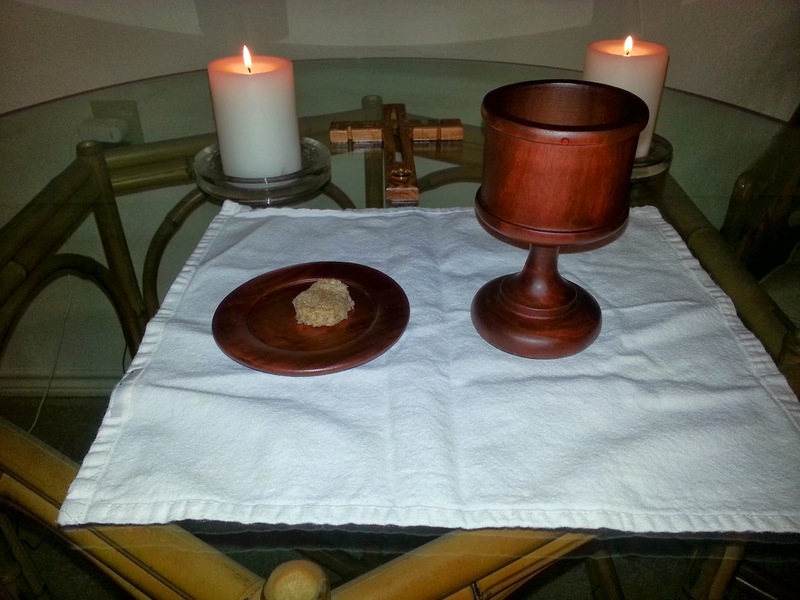 It is time for the institutional church to welcome divorced and remarried Catholics to receive the sacraments. It is time for the institutional church to drop its ban on homosexual partnerships and on contraception. The real issue is what does it mean to live God's compassion and justice in our church today? I believe it means embracing everyone as spiritual equals in the family of God. The German faithful and their bishops are speaking out and this could be a positive sign that change is in the air. As you know, I am an optimist! Do you share my optimism? "The German faithful were not satisfied with the Church’s present teaching concerning remarried divorcees, “mixed” marriages and register office marriages and expect concrete changes from the Church concerning all three. “A pastoral approach which only sees such relationships as sinful and calls for repentance is not helpful as it contradicts the positive experiences which such couples have”, the bishops’ conference report says. German Catholics above all want to see remarried divorcees allowed to receive the Sacraments under certain conditions. “The expectation that the Synod will open new pastoral possibilities is very high indeed”, the bishops say. The fact that neither the question of homosexual partnerships nor that of the different methods of contraception, both of which had been addressed in the first questionnaire, had been omitted this time had been sharply criticised in the replies. Those responsible in the Vatican for the coming Synod would be “well-advised to get down to a really committed, sound and communicative preparation” as the pressure of expectations had increased considerably, Bishop Heiner Koch of Dresden, who is responsible for family affairs in the German bishops’ conference and who will be accompanying Cardinal Reinhard Marx to the Synod, underlined." and the sheep as guided and protected by God. is Psalm 23, The Lord is my shepherd. of that Jewish tradition that they shared. and how Jesus wanted them to follow him. it remains alive for us today. and what Jesus wants us to do. Like a good parent, or a good teacher, or a good friend. deciding to tend to himself after the sheep are safe. • Jesus shoulders the responsibility that comes with power. he gives his life tending his flock. undone or half done or badly done when it gets harder. and applies to the entire human race. all those other flocks that need tending. to tend to one another. We are to be Good Shepherds. in the middle of Toledo. and apply it to our own lives. good friends, good citizens, good voters, good persons. We are called to follow the Golden Rule. just the way Jesus taught. Pope Francis met with Laurent Stefanini, the openly gay foreign service officer chosen by France to be ambassador to the Vatican, for fifteen minutes this weekend. 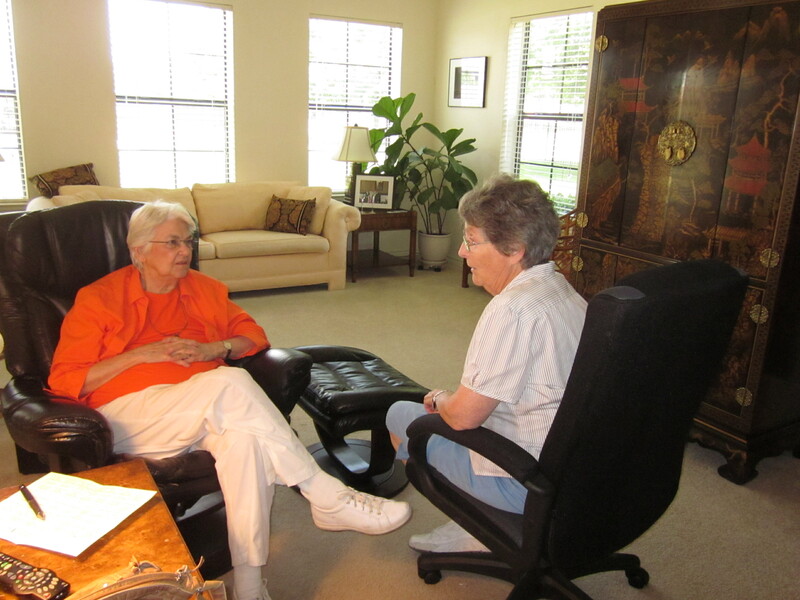 In March Dotty Shugrue and I visited our dear Sister Priest, Adele Jones in San Antonio. We spent many hours sharing stories and giving thanks for the gift of joy that Adele lived to the fullest during her lifetime. Nursing Aides came in and out of the room. She called them her angels, but, it was obvious from their conversation with Adele that she was their angel too. Adele asked us that she wanted to die peacefully and that she was grateful for Hospice Care because it provided a way to die with dignity. Adele and I had planned her funeral before our visit and so we went over every detail. She instructed Dotty and me about her wishes: "Dress up, wear white chausables, I want the whole works! "she said between laughs. "And I want incense." Dotty volunteered to find her incense burner and get it ready for use. 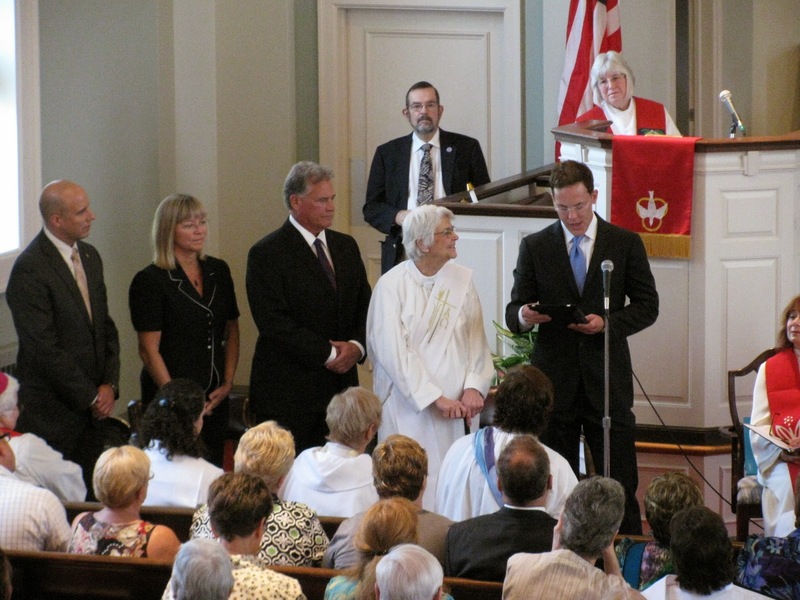 Adele described the music and the role her son Rick would play in the liturgy. :Rick will play beautiful classical music on the piano and Alex will sing.... I want the recessional to be "when the saints go marching in. Make sure you read Philippians from the King James bible! " 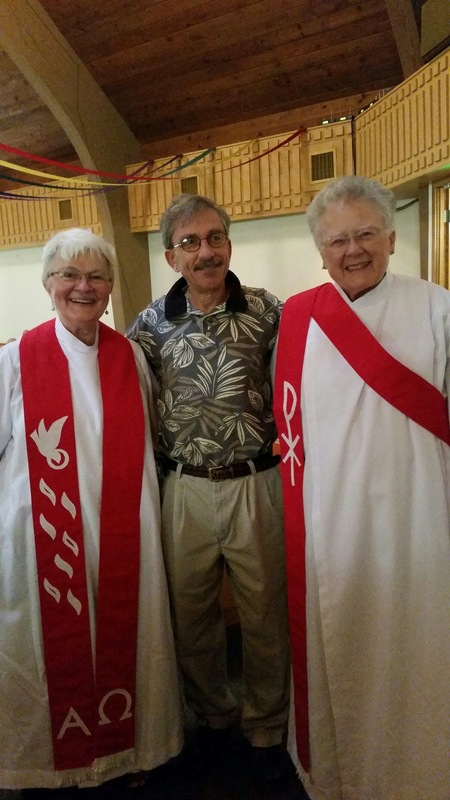 We have our marching orders and we plan to carry them out on May 9th when Dotty and I return to San Antonio to celebrate a festive, joy-filled liturgy for our dearly cherished sister, On May 16th, we will ordain 5 more women in the Association of Roman Catholic Women Priests. During the Litany of the Saints, we will pray to St. Adele, our first woman priest saint, in the Association of Roman Catholic Women Priests. I am sure our dear Adele, now in the fullness of unending joy, is holding us in the heavenly light of boundless love. Dear sister, Adele, we love you and we will miss you. May you sing and dance with the angels forever! A truly holy and courageous woman gently and peacefully made her passage home to our loving God in the wee hours of this morning. I am sure that the welcome for her included the New Orleans jazz trumpet( that she also played)sounding the joyful “When the Saints Go Marching In” for to us she was a saint. She was an inspiration in love and courage, especially the courage of taking on the religious establishment at so many levels as the story told below will show. She was also our mentor and precious friend and counselor hearing the troubles of others, including our own, until the end. 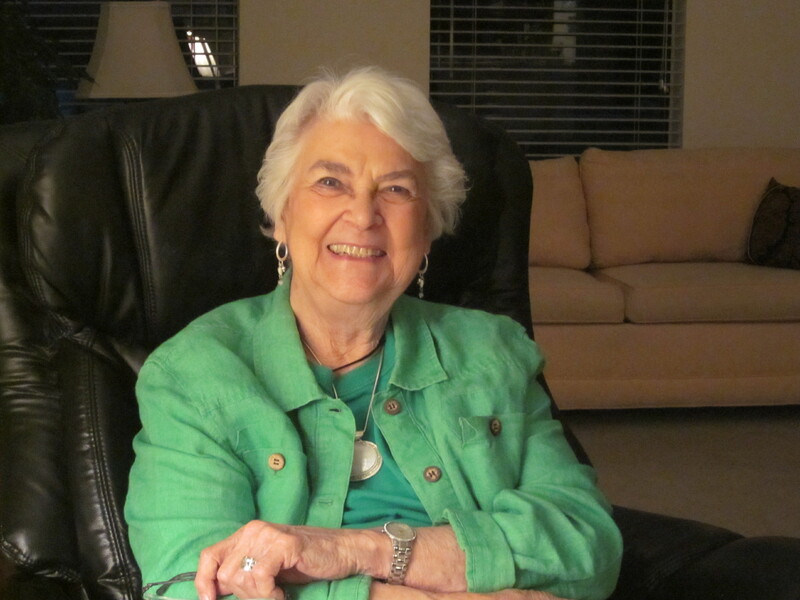 Her beloved son, Derek H. (Rick) Jones, a prominent Doctor living in California and his partner, Bart, had visited with her this past weekend for her 88th Birthday. When he called to share her parting he told us that she had been waiting for our visit (made the week before (April 13-15) and his visit before she could let go and meet her loving Sophia face to face. Indeed she had rallied, embracing all of us, her family, Rick and Bart, Randy and his children and grandchildren who visited on Easter, her friends Jane and Alex and Roger and Bridget Mary and Dotty, and Pedro, Michel and all of the Staff and Judy and I in her loving arms. Jane and I spoke and cried together as we shared how much we will miss her. And yet we all agreed that she will be our angel. Judy B added that our Litany of Saints should include “Adele Decker Jones, pray for us”. 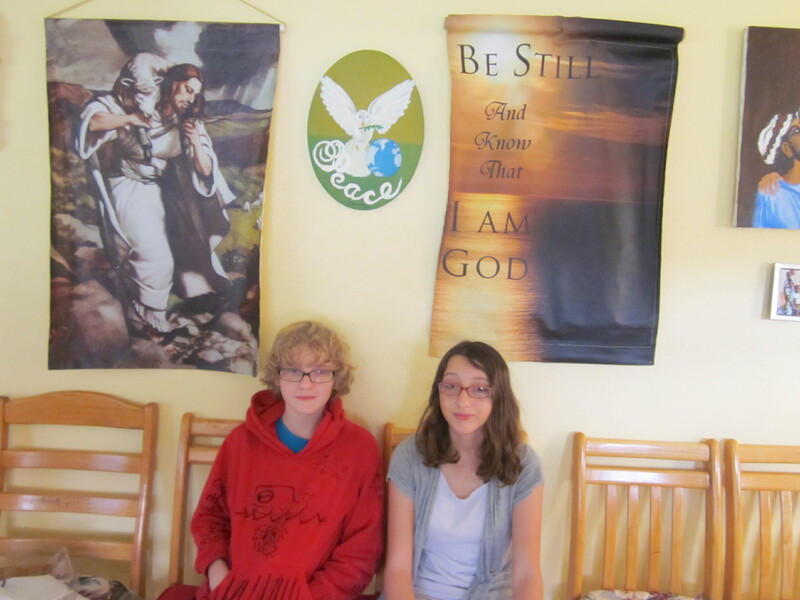 The following story of Adele’s unique and blessed life started this blog in July of 2013. It is also befitting as a Eulogy for a life well lived in the service of Christ. Rev. Dr. Adele Decker Jones is no usual octogenarian. On 9/10/11 at age 84 she was ordained a Roman Catholic Woman Priest with the Association of Roman Catholic Women Priests. Her ordination is valid as it is in a line of apostolic succession continued when a male bishop in good standing with the Pope ordained women bishops in Europe in 2003 to ordain other women. The name of this male bishop is known and will be revealed upon his death. But in accepting Holy Orders Adele is breaking Canon Law 1024 that states only males can be ordained. The penalty is “automatic excommunication ” from the Roman Church,the church she has loved since early childhood. Rev. Dr. Jones, like other women priests, does not accept that anything or anyone can separate her from the love of Christ but this does not make the penalties of ostracism any the less difficult. What kind of “elderly woman” chooses such a difficult road? Where does she get her conviction and her courage? Where does she get her strength? 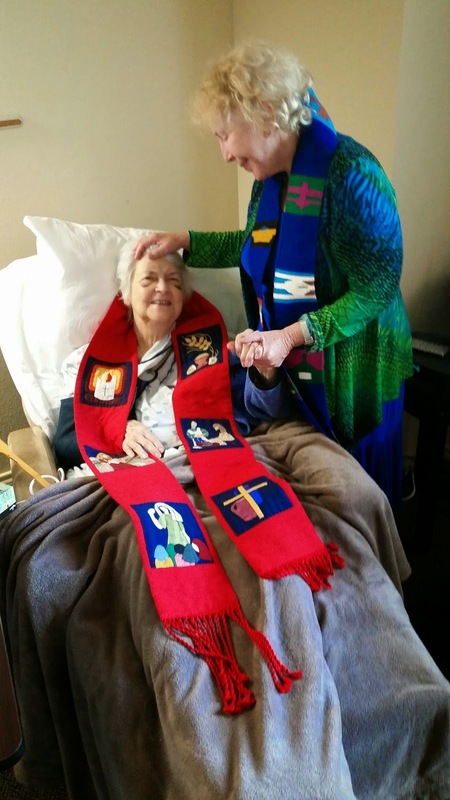 At a time of life when many of her Catholic peers are picking out peaceful plots in sacred ground, a Roman Catholic Cemetery, Adele is finding joy in prophetic obedience to the God she has served all of her long life. She is finding a way to bloom where she is planted now,in a retirement home in San Antonio, Texas where she has lived since 2009. She is a quiet presence, sought out without any level of self advertisement as she does not want to offend anyone. A tall and beautiful woman who looks younger than her 86 years with silver white hair that reflects like a halo, staff members and residents alike call her Dr. Jones and seek her counsel and prayers for their lives. Her unassuming but clear priestly presence makes a difference to all who know her. She risked the wrath of the Roman Catholic Church when in 2008 the church compared women’s ordination to pedophilia, as the same genre of mortal sin. When she learned of this comparison she was incensed and decided to find the women priests that the church now condemned and find out if she could become one of them. 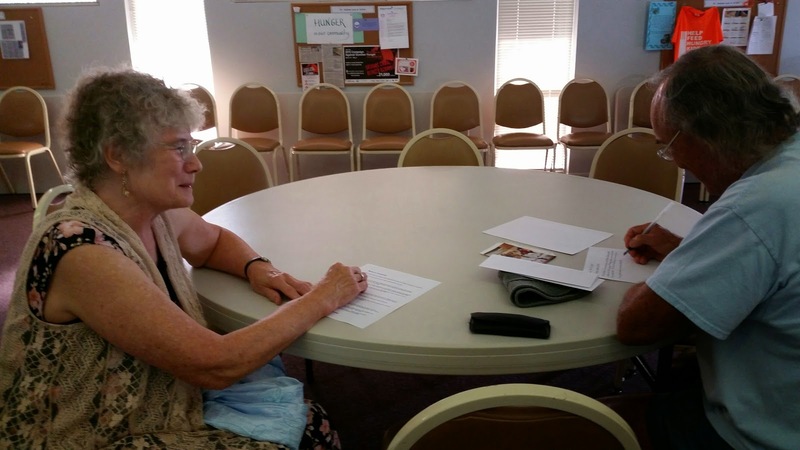 When she found the website at ARCWP.org and called Bridget Mary Meehan, the ARCWP Bishop, she found that there was no upper age limit. What was important was her call to serve as a priest and her preparation. Adele is extraordinarily well prepared. She has had a full career as a psychiatric nurse and counselor. She has a Masters in Theological Studies earned in 1988 at the Oblate School of Theology in Texas. 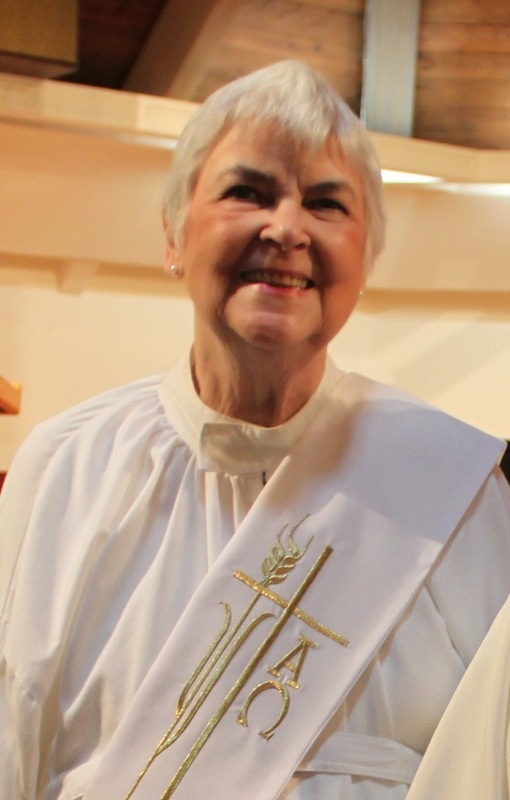 She also has a MDiv from the Oblate School earned in 1991. At that time Protestant denominations encouraged her to become ordained with them, but she wanted to remain a Roman Catholic. She reflects that it was very hard to get into the MDiv program as the archbishop had to approve. She refused to promise him that she would never seek ordination, but said that she could never agree to the Archbishop running every aspect of her life at any rate! They agreed that it was unlikely that she would be able to become a priest in her lifetime. 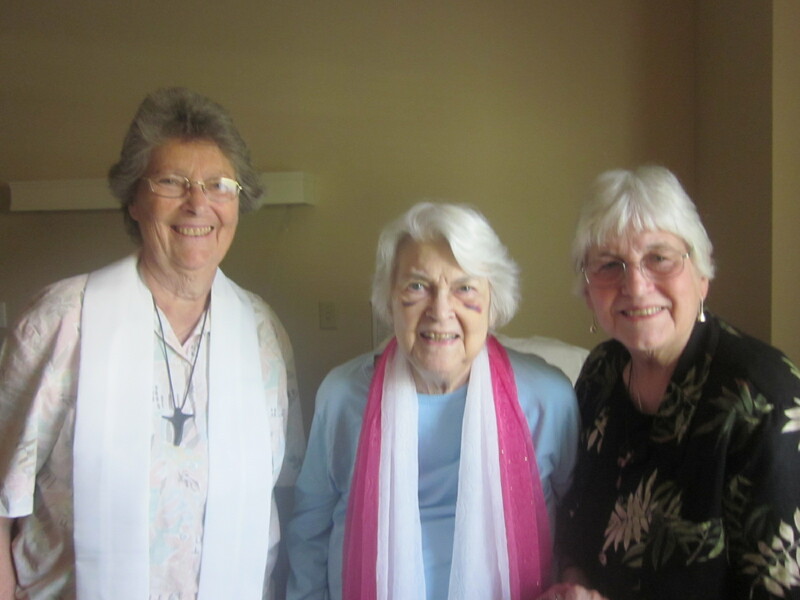 With that understanding, having excelled on her entrance exams, she was admitted to study and was the fourth woman who graduated from the Oblate School of Theology in 90 years with a MDiv degree. In 1997 she graduated from Garret Theological School of Northwestern University with a Doctor of Ministry Degree. 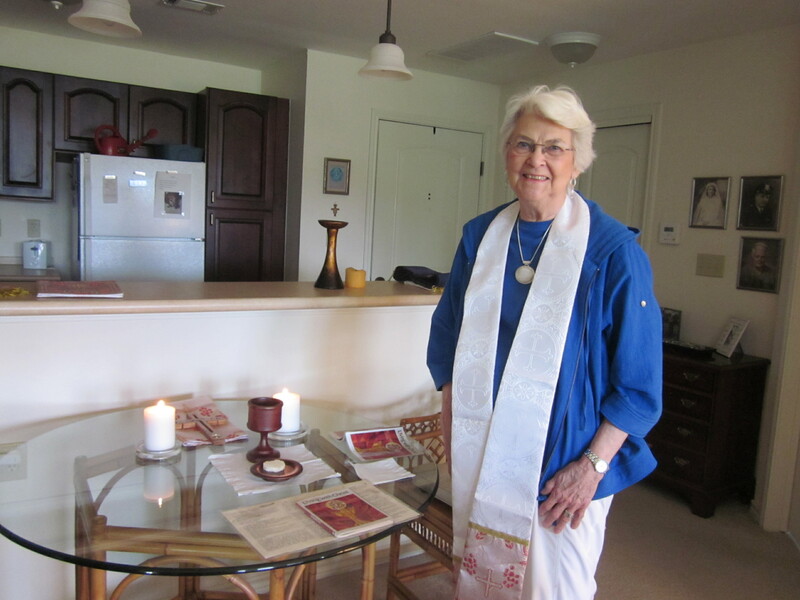 This completed her professional preparation for pastoral counseling and for the priesthood as the MDiv is the same as the preparation taken by the male priests. Many young Franciscans were in the MDiv program with her and it was then she realized her own bent toward Franciscan spirituality. She became a Third Order Franciscan and entered the Fraternity with her male Seminarian friends. 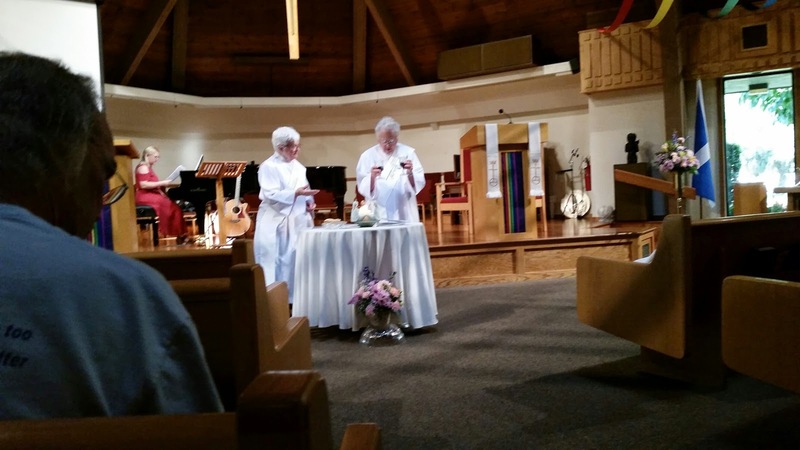 They also assured her that they welcomed women’s ordination in the Church. She describes this experience with the Franciscans as an experience of grace. She notes that St. Francis’ charism was joy. As she looks back on her life she realized that there were many times in her life when grief and sadness might have overwhelmed her: but she chose joy instead. While she was in utero her mother experienced the death of her mother, Adele’s grandmother. Adele was aware of her mother’s deep grief, yet her mother, also a Nurse and a devout Catholic worked hard so that Adele would experience the joy of her family and the strength of the women who were her legacy. The family also struggled with the Great Depression and economic hardship as they struggled to put grief in its place and find the joy in life. Adele loved her father, a policeman, very much but was challenged by her parents’ divorce and her mother’s burden as a single Mom. She was also deeply effected by the death of her father when she was fifteen. Yet she chose to hold on to the joy that her father brought into the lives of herself and her younger brother. 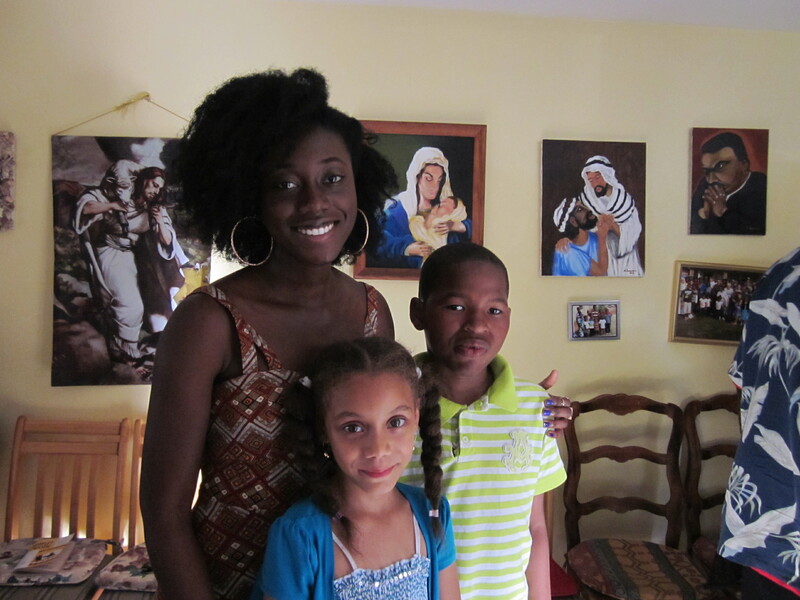 With help from her Aunts she was able to attend Catholic School from grade school through high school. There she loved the nuns who shaped her life spiritually, first the Dominicans, then the Sisters of St. Vincent De Paul. She learned to play the trumpet and earned a music scholarship to the Catholic High School. There she learned to discern her calling. On her seventeenth birthday she entered nursing school perceiving service to the sick as her calling. In 1947 she became a psychiatric nurse and also met and later married her husband Lloyd. In 1952 and 1965 her sons were born, Randy and Rick. They were and are the joy of her life, as are Randy’s children and grandchildren. Yet learning for Adele was also a great joy and she completed her AA in 1963 and her BA in 1976 at the University of Texas Victoria Campus. The additional degrees were helpful as she faced a divorce,also in 1976 after almost 30 years of marriage. This caused much grief, but she was also able to move on alone and to choose joy once again. In 1980 she moved to San Antonio and worked for the Chancery also hosting a program on Catholic Television. As Adele faces the many adjustments of aging and health she does so without complaint or depression. Once again, she faces the inevitable set backs of life with prayer and with joy. 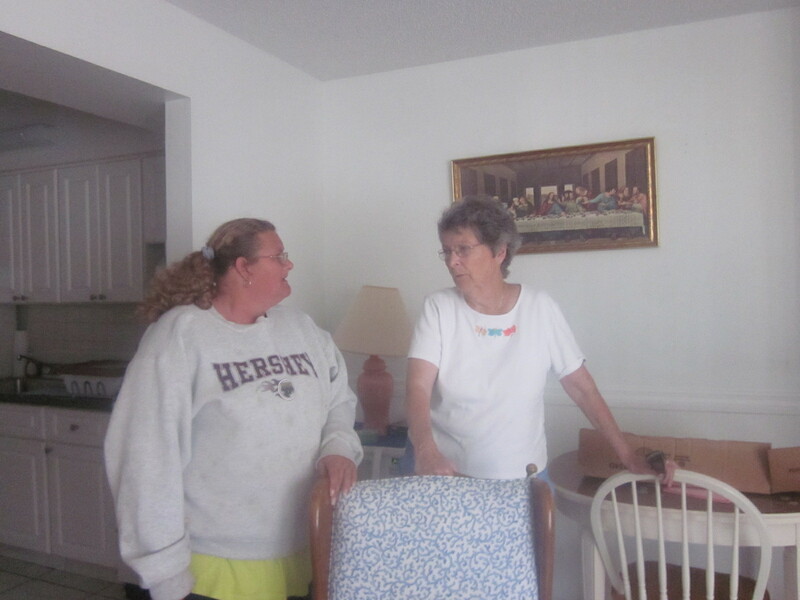 She reflects that she identified with her Aunt Katy who was a red head with keen wit and a wonderful sense of humor. In her own life and in her career as a nurse and pastoral counselor she has been faced with both tragedy and comedy. It is a grace that she saw comedy where others could only see pain. Never once did she minimize the pain of others, but she sought to help them find ways to adapt and cope even in the midst of tragedy. And, she taught them to laugh wherever this was possible. It is one who seeks joy where there is disappointment and grief that has the courage to choose to become a woman priest. Adele notes that God has worked in dramatic ways in her life. Opening the door to the priesthood to women in the Roman Catholic Women Priest Movement is one of those dramatic occurences. Rev. Dr. Jones says that all of the preparation she had academically and experientially came to a fulfillment in the unexpected grace of her ordination. 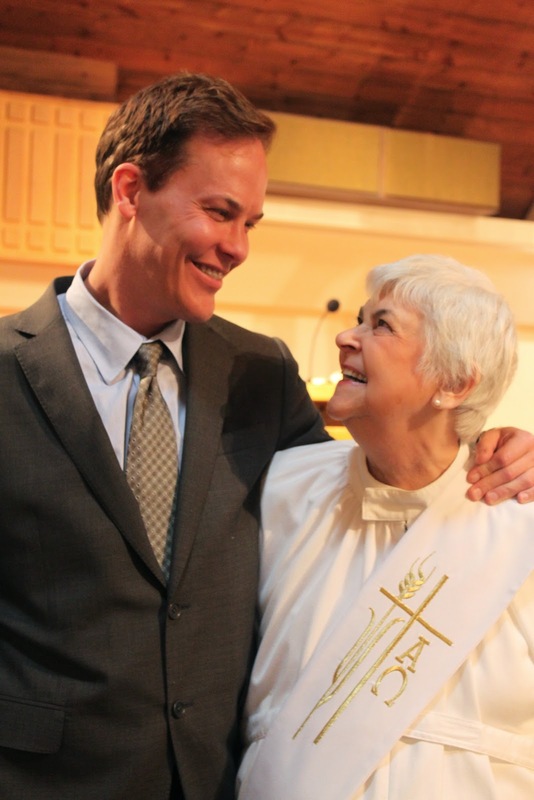 Every moment of her life has led to this and every moment that she has left will be dedicated to serving quietly and modestly as a Roman Catholic Woman Priest . 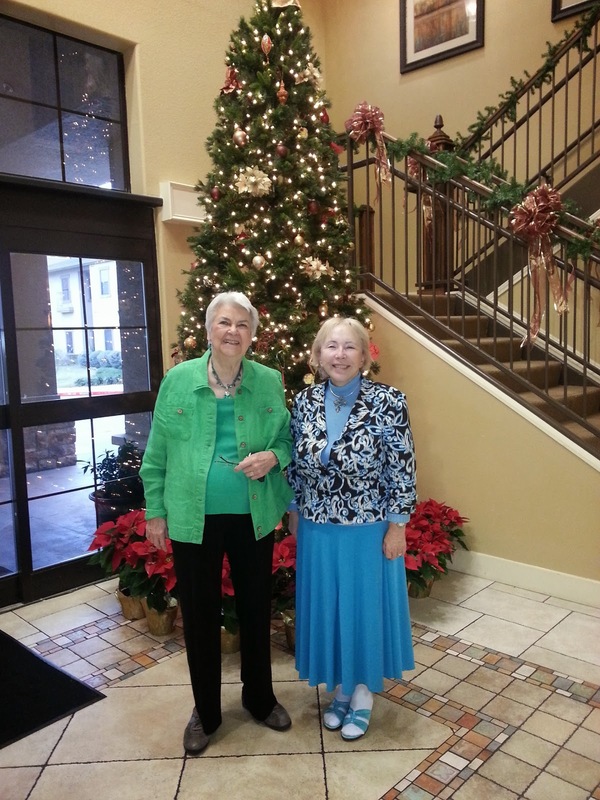 Another Priest, Judy Beaumont and I went to San Antonio to minister to Adele,our older sister priest. Instead she ministered to us and we came away immeasurably enriched, knowing that we had been in the holy presence of a woman of great wisdom, and joy. Rev. Dr. Adele D. Jones, Roman Catholic Woman Priest, Pray for us. Joy comes in the morning.The Circle is unbroken for she is with us and waiting for us still. The presentations continued with a short video, “One Billion Rising,” which featured Tim Heintz and Tena Clark’s song “Break The Chain” and choreography originally performed by an anti-trafficking, anti-violence flash mob on Valentine’s Day of 2013. Coordinated by Lori Teague, Director and Associate Professor of Dance, students in Emory’s Dance Department had the opportunity to perform the choreography once again — for the Cannon Chapel audience. Involved with the Dance Department myself, I got to witness the chapel’s energy from the front of the crowd as we started to perform; the audience slowly began to move, clap or do anything that would confirm their presence. The several children in the audience ran to the front, jumping up and down to the music...."
"The multitude of art mediums and performances made for an effective program that, at the least, introduced a few more people to the severity of trafficking and abuse throughout Atlanta. Various performers and organizations brought faces to their names, including Out of the Darkness, an organization that directly interacts with trafficking victims at weekly events. One of these events is called “Princess Night,” during which volunteers travel to areas where trafficking and prostitution run heavily. On Princess Night, the organization and its volunteers aim to increase victims’ awareness of their options by bringing with them a prayer, a card, a lipgloss with the “Out Of The Darkness” hotline and a rose for the victims. Although the overall situation is simultaneously uncertain and dire, all artists and organization representatives that participated in Saturday’s program maintained a certain optimism. Even Racine, who acknowledged that the smallest factors can yield catastrophic results (“Pretty Woman” and its effect on girls), is confident that law enforcement — and the public — have the “tools in [their] arsenal” to find and to stop those responsible for trafficking and violence." 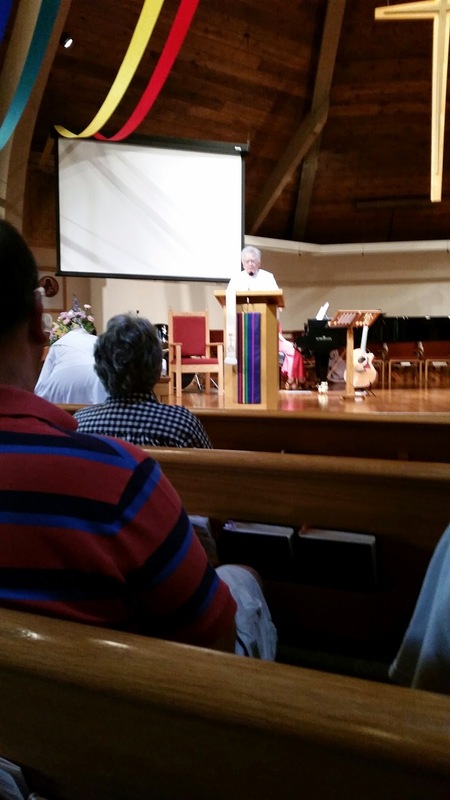 Here we present a retrospective on five months of our Good Shepherd ministry in Fort Myers, Florida. During this period we celebrated a bountiful Christmas with our community and moved into a new year with joy and determination to continuing to make a difference in the lives of those we serve. 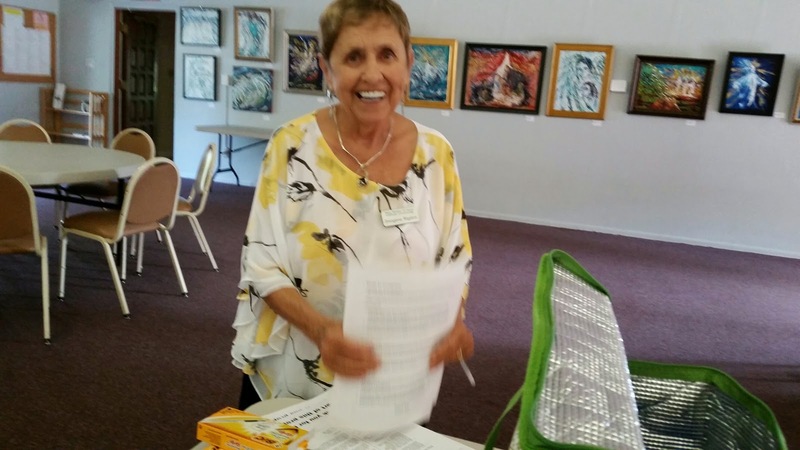 Attendance and participation at all events remained consistent and many new people were served. The relationships we have with our people, volunteer assistance, and the mutual aid approach to empowerment and the whole person, remain the most important factors in the success of our work to help people out of poverty and into work, incomes, education and housing. We continued to assist people in maintaining and obtaining affordable housing and worked with our parents and youth in school retention and success. We now approach the ending of the school year and planning for summer. We will be exploring program designs and possibly grants and donations for this summer program. 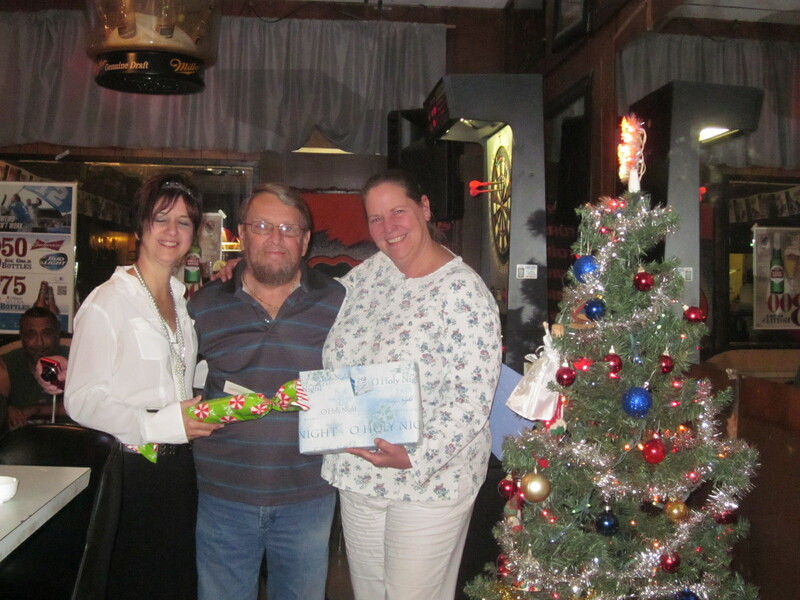 Due to the generosity of The local Orioles Club(pictured below), the Lamb of God Church, Gini Beecroft and the Breckinridge Community and several individual donors we were able to give Christmas gifts to thirty-five children and youth, several large families and special needs adults. These included gift cards for the older youth and donations to help families. Books and clothing were part of the gifts and Supermarket cards were also given for food for the families . 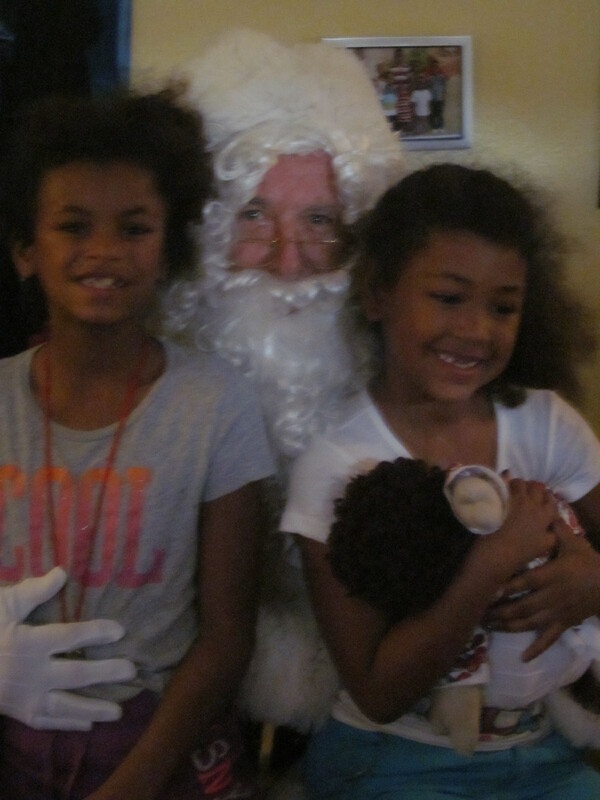 We had a great Christmas party and Hank Tessandori was Santa Claus to the children’s great delight. Yet, in a way, Christmas is every day for us as we celebrate birthdays and special occasions throughout the year and rejoice in the gift of loving community. 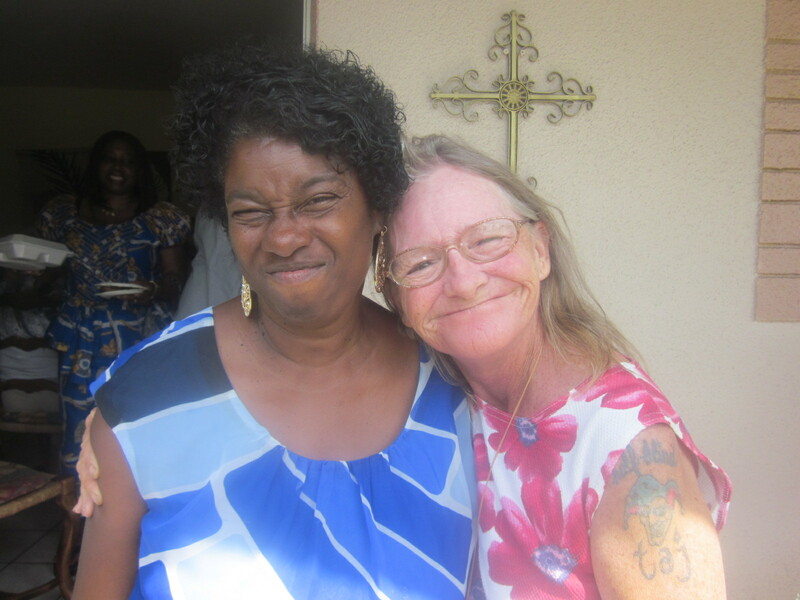 ( In the picture below Donnie is celebrating her 60th birthday with her friend Lauretta hugging her and Pearl Cudjoe, one of our faithful leaders, in the background). With the December 2014 tally of 102 meals, we served 1474 hot meals in 2014(not counting seconds and take home). 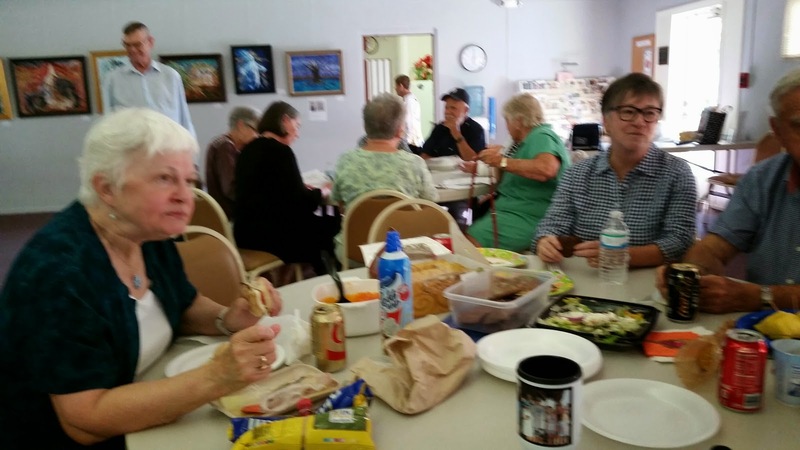 To date in 2015 we have served 498 meals on Sundays and for Holy Week gatherings and 70 meals on Tuesdays for a total of 568 hot meals as of 4/21. 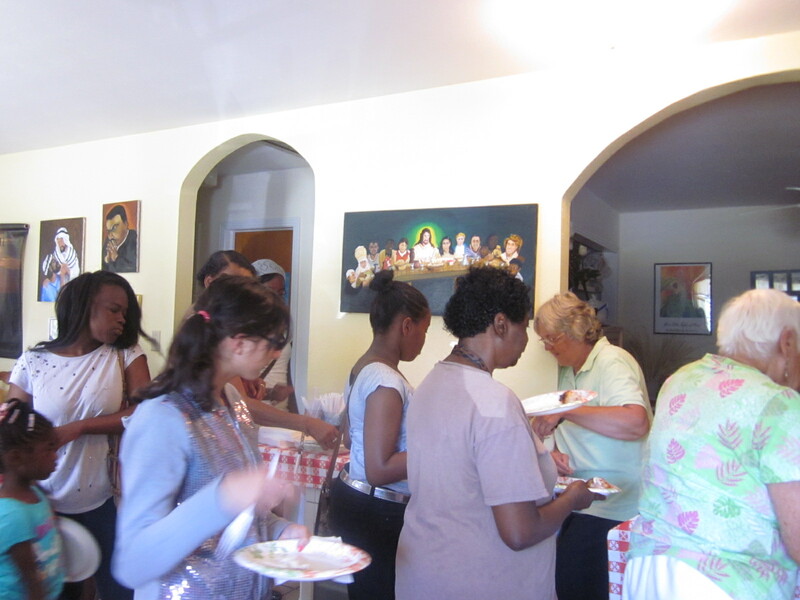 We continue to thank our volunteers including the McNallys, CTA and Country Creek, Gini Beecroft and Breckinridge, Sally and Rob Patterson, Chris Miller and Rick Judy and Lisa Munklewitz, Evelyn Touhsaent and Cliff Woods and several Lamb of God members and our own Judy Alves and Pearl Cudjoe who have remained constant in cooking and serving for us. Margaret Sousa, the Manager at Palm Harbor Church Residences continues to share canned goods with us and we reciprocate by assisting some of their new residents at move in. Others donate food from time to time. The LOG, Pope John 23rdand St. Columbkille Thrift Stores continue to help us with clothing and furniture and other items to establish households at reduced prices. 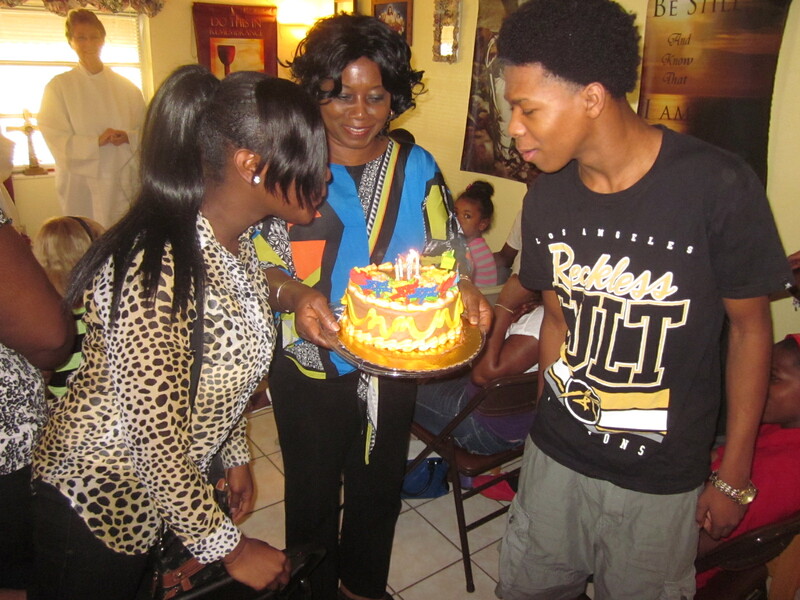 Birthday celebrations are a regular part of our weekly celebrations as well. In January 2015 we were able to pay $1500 on the Student Loans of our Freshman at FGCU due to accumulated educational donations earmarked for this. We also visited schools and had parent conferences on the school progress of several other children. Both Pastors and some of our members and Board Members like Judy Alves also mentored children and youth in specific subjects and helped them to develop other competencies. Weekly we are able to reward youth with small stipends of 3-5 dollars for completing their Sunday school lessons successfully using Urban Ministries materials that are quite good. Five – seven youth 13 and over participate regularly. This is not only to get them into the content but to improve reading, comprehension, critical thinking and writing skills. Additionally we ask our youth and parents to give back by assisting people to move into housing in a variety of ways. 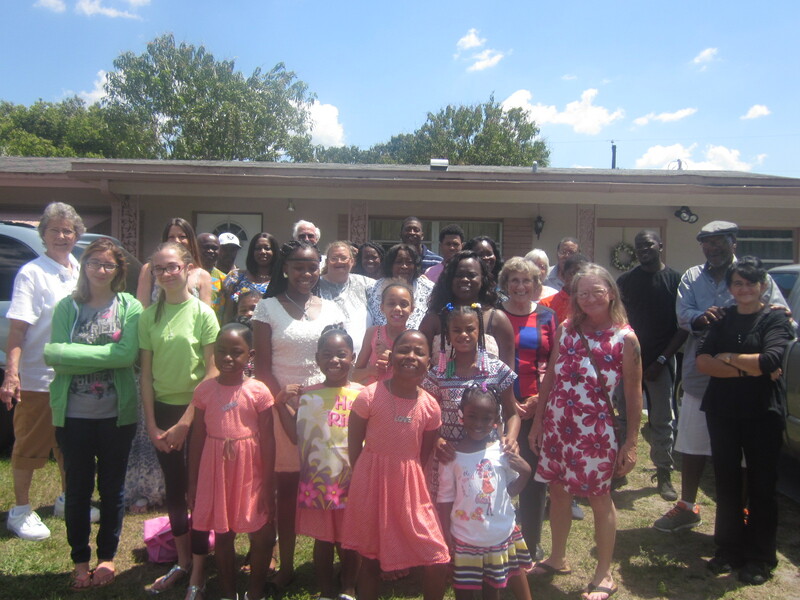 Thirty-five individuals including two families and several pets have resided in Joshua House and then moved on to affordable housing, ten have lived there since we have turned it into a hospitality house. 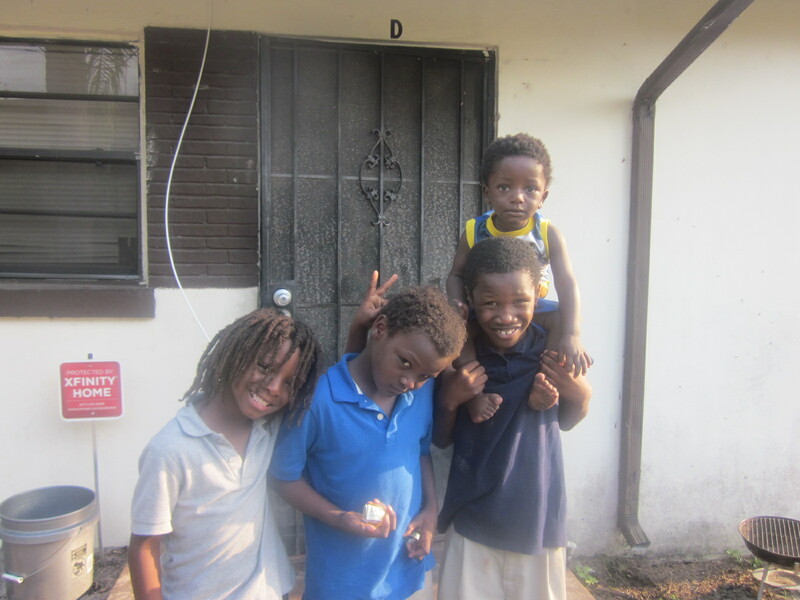 A family of seven continues to reside there since Nov. 30th but they have saved enough to move out in May of 2015. People unable to afford market housing temporarily and who are not substance addicted or uncompliant with medications are eligible for this program after we get to know them and assess the situation. 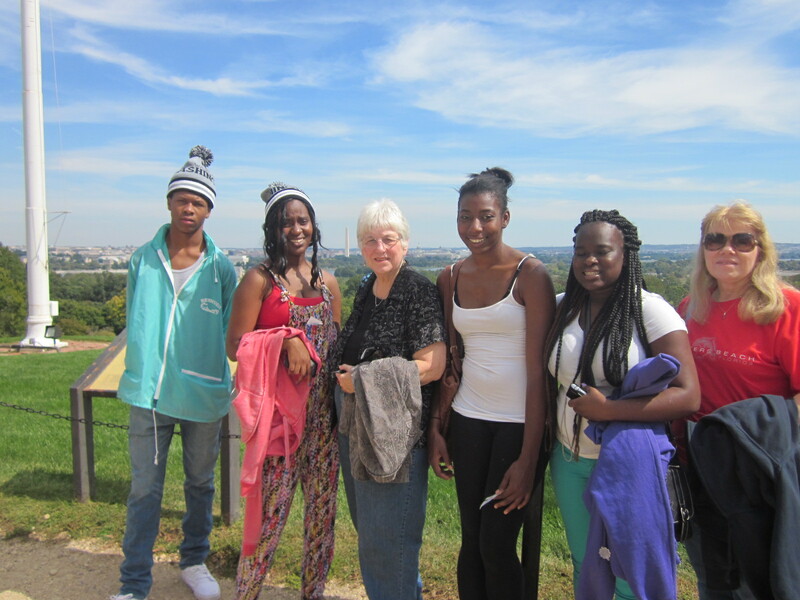 Several in this picture once lived in Joshua House. We are blessed to say that since 2008 there are over one hundred people whom we have assisted into affordable housing with emotional, spiritual and material support. 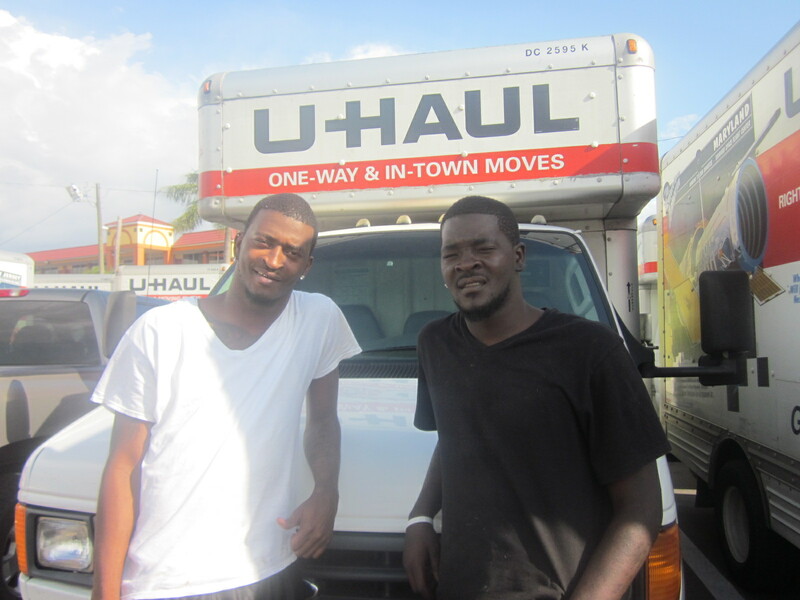 During this period of time( 12/14-4/15) we assisted five families to move into permanent housing. Two of these women we have known for many years and it is again the quality of our relationships and consistency in their lives that gave the support needed to finally make good choices and follow through. This supportive approach helped Awsha, a mother in her thirties to reunite with her seven month old daughter and we also paid for Security and furniture as well as bus passes to work. Brenda, now fifty, returned to Fort Myers after several years living from place to place north of here. 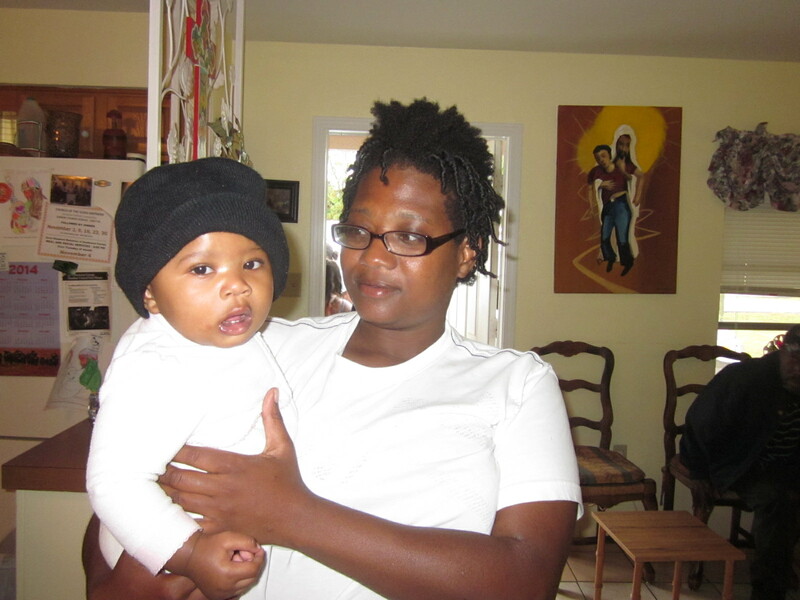 She returned to us broken, sick and crying and thankful “to be home” but in need of help to become housed again and connected to medical services. She had lost both of her parents within the last month and was bereft. She sees us as her remaining family. We placed her in a Motel as we sought housing with her. (Another woman living in her car also spent a night in this Motel). 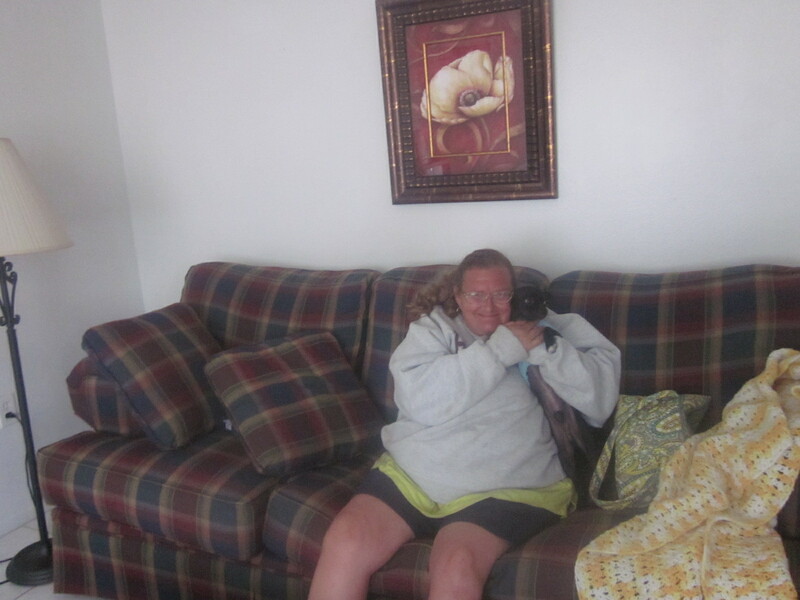 We actually have had to move Brenda and her little dog, Scrappy, three times in six weeks as various problems with the apartments attended her first two moves. 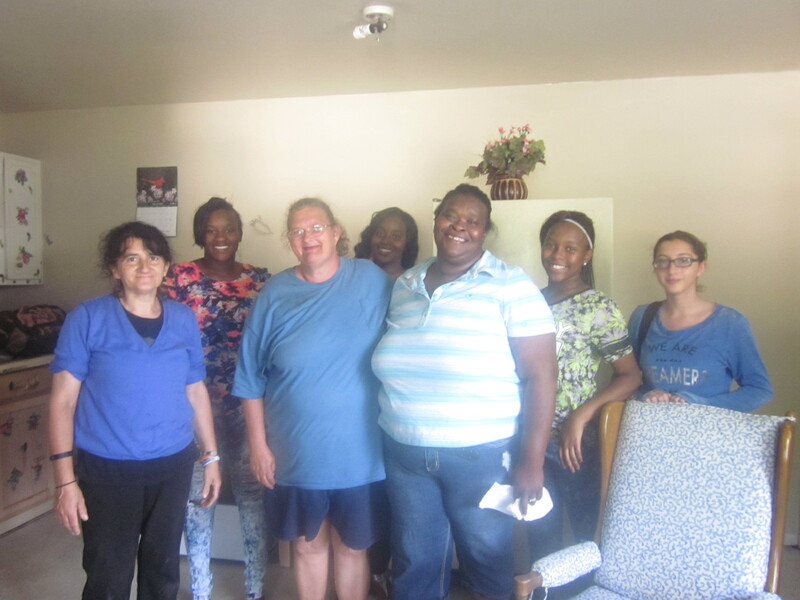 We also moved two Seniors, one from the East Coast with three large birds, into affordable HUD assisted housing at Palm Harbor. For that we had the help of Rev. Miriam Picconi a RC woman priest from the Palm Coast and her generous helper David. 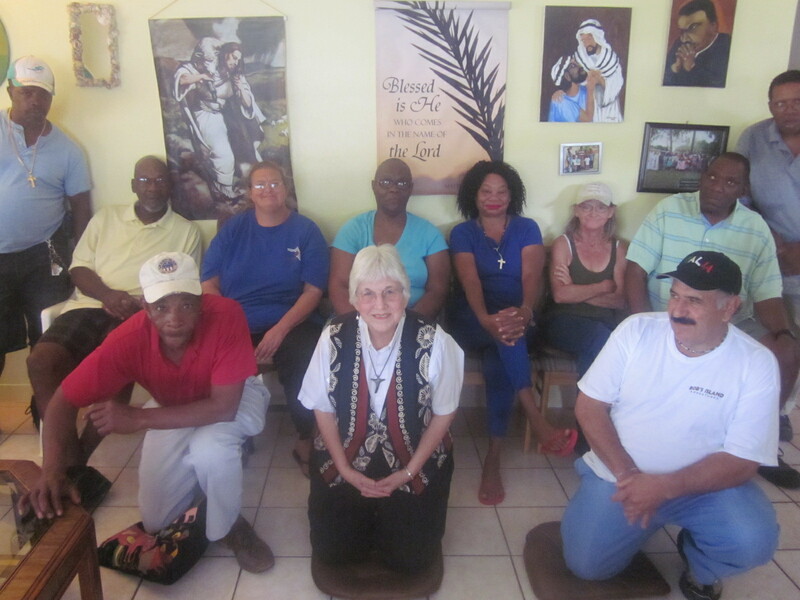 A couple with five boys under the age of nine, and an older girl still to join them, was also assisted with furniture, food, clothing and other basic needs. The boys are now attending our Sunday school and are a pleasure to know. They are pictured below, also are Awsha and her baby and Brenda and Snappy, now housed. 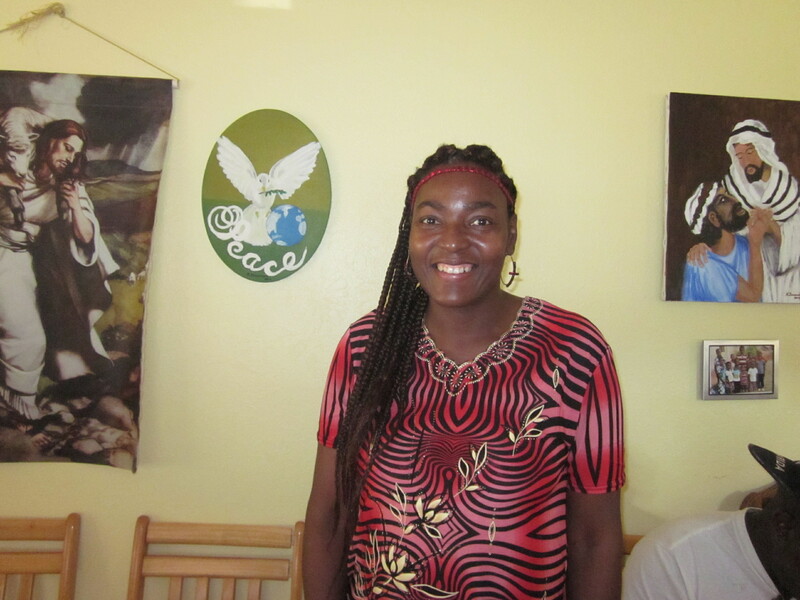 Brenda is such a woman of faith and joy that it is a pleasure to have her back in the community as well. Each of these moves cost us from minimal amounts up to thousands of dollars. These costs include Security, Utilities down payments, furniture and household goods and other costs. We are in continual need of donations to assist people in moving out of homelessness and inadequate housing. We also minister to those in need of medical and mental hospitalization, those in hospice and those sick at home. In the last two months we walked with one of our men as he dealt with new psychiatric and diabetes medications. He began passing out in the streets and becoming psychotic and it took three hospitalizations in two hospitals to get him back on his feet again. 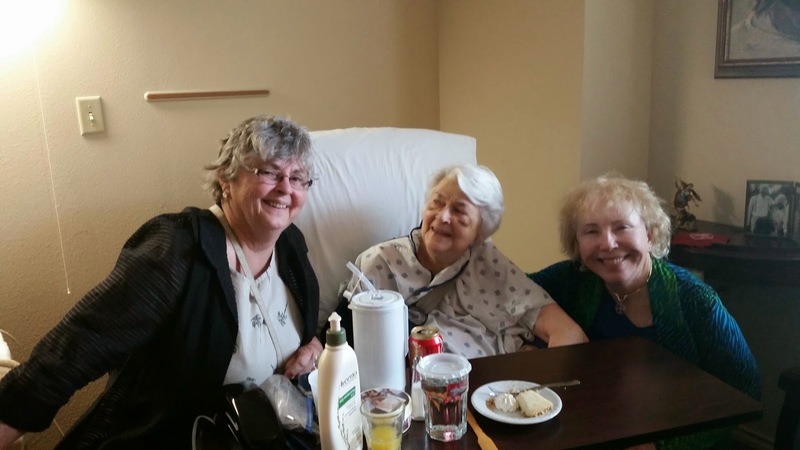 Another of our members is in hospice and we attend to her and her family where some reconciliation was needed. Another family is experiencing gang violence and drive-by shootings and we are challenged to help the family through this. We were also pleased to baptize one of our twelve year olds on Easter. It is a joy to see her grow in her understanding and actions. Our children and youth continue to be a source of joy to the whole community. Most of all it remains a joy to witness the love among the members of our Tuesday (formerly homeless and homeless) and Sunday communities(that do overlap) where all are welcome at the Table of Christ and at our hot meals and continual fellowship. Co-Pastor Rev. Judy Beaumont, RCWP, and I say a heartfelt thanks be to God for this blessed Community and for all who help us to serve.